The nondestructive inspection using magnetic domains and domain walls of a magneto- optical sensor has some inherent disadvantages. Most of the disadvantages are due to the use of the vertical component of die magnetic leakage flux density over the object surface. Considering that the MO sensor contains a rigid substrate, it is impossible to bend it. Correspondingly, the inspection of cracks on structures having curved surface is problematic.This paper introduces two novel NDI methods which are useful for inspecting of micro cracks on curved surface structure e.g. on die internal wall of a tube. The first method uses a narrow magneto-optical sensor, and the second uses the distribution of the horizontal component of the magnetic leakage flux.Several examples of inspection of micro corrosion fatigue cracks on the internal surface of a carbon steel (JIS STS410) tube are presented. The advantages of the nondestructive inspection (NDI) by use of magnetic domains of a magneto- optical sensor(MO sensor) are: elimination of the need for paint removal because it is possible to inspect cracks non-contactively, the leakage flux distribution around a crack is transcribed on the MO sensor by a high spatial resolution, high speed inspection, easy documentation of results via video tape, and easy analysis of this image (11 . However, these NDI methods have some disadvantages due to the use of the vertical component of the magnetic leakage flux density over the object surface. Correspondingly, the inspection of cracks on structures having curved surface is problematic. Considering that the MO sensor contains a rigid substrate, it is difficult to use the vertical component of the magnetic leakage flux for a specimen with a curved surface. In this case, the lift- off could have a large value and could vary over the surface of the specimen. Besides, the inspection conditions of a particular crack change, which results in decrement of the inspection sensitivity . This paper proposes two novel NDI methods, which can be useful for inspecting of micro cracks on curved surface structure eg. on the internal wall of a tube. The first method uses a narrow MO sensor, and the second uses the distribution of the horizontal component of the magnetic leakage flux. 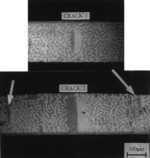 Several examples of inspection of micro corrosion fatigue cracks on the internal surface of a carbon steel (JIS STS410) tube are presented. Fig. 1 shows small cracks existing on the internal wall of a tube with an internal radius, R, while the x-direction is the axial direction of the tube. The longitudinal direction of the crack is parallel to the y-direction. The internal surface of the specimen is parallel to the x-y plane. In case of magnetization along the x-direction, magnetic leakage flux occurs around a crack. The x-component of the magnetic leakage flux density B is designated as Bx, and the z-component of B is Bz. The Polarization plane of linearly polarized light transmitted through a MO film is characterized by its Faraday rotation. The output optical intensity which corresponds to a particular point of the MO film depends on the intensity of the external magnetic field in this point and the setting of the analyzer. The MO sensor contains a MO film grown on a substrate of (GdCa)3(MgZrGa)5O12 and a vaporized aluminum film for a reflection. The Faraday rotation is almost doubled in this reflection type optical arrangement due to the double passage of the light through the MO film. Table 1 shows the specifications of the MO sensor which used in this paper. The crack can be visualized as a high contrast dark/bright areas  of the sensor which is due to the presence two kinds of large magnetic domains in the vicinity of the crack i.e. domains with magnetization directed correspondingly along and opposite to the surface of the sensor when the analyzer is fixed. A layout of the MO sensor for transcription of Bz which is due to the presence of a crack on the internal wall of the specimen while Bz is directed normally to the surface of the sensor is represented in Fig.2. Large width of the MO sensor leads to a significant scanning area and scanning speed, but it also results in a large lift-off Zlift above the curved surface, which diminishes the sensitivity of the method. Correspondingly, -the use of a narrow MO sensor decreases the unfav orable influence of the lift-off effect. The necessity of rotating and moving the MO sensor along the internal tube wall leads to employment of a complicated crack inspecting system. Consequently, both the scanning speed and the simplicity of operation of the scanning equipment have opposite sign contributions to the sensitivity of the crack inspection when Bz is used. A layout of the MO sensor for transcription of Bx which is parallel to the y-z plane IS depicted in Fig.3. Considering that the MO sensor could not be bent, but it could be ground, the MO sensor can be processed into a disk-shape with the MO sensor boundary being parallel to the curved surface. This diminishes the unfavorable lift-off Besides, the employment of this layout allows to achieve a constant value of the lift-off over the curved surface, to scan a large surface area at the same time, and to minimize the inspection movement. The specimen is a part of a tube with an internal radius R of approximately 5mm, which is commonly used in a nuclear power plant. After an environmental fatigue test(temperature of 290°C and Dissolved Oxidation Concentration of 1ppm), the specimen (JIS STS410) has been cut in axial direction. Two cases of inspection targets have been studied. 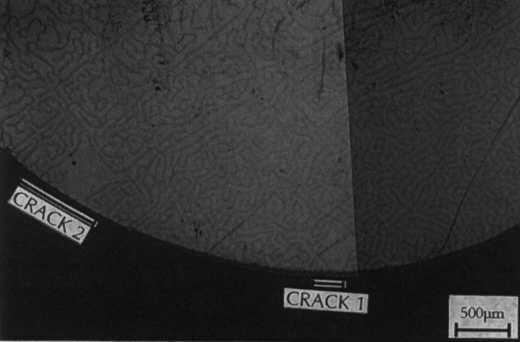 In the first case, there were two micro corrosion fatigue cracks with a surface length of 250µm (CRACK 1) and 70Oµm (CRACK 2) on the internal wall of the tube at almost the same circular arc (Fig.4). 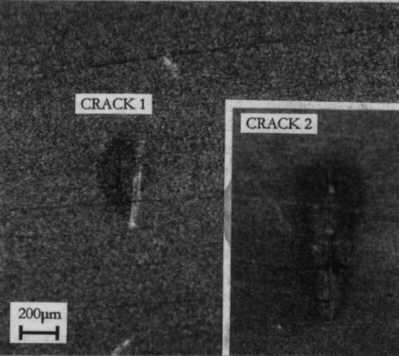 In the second case there were several micro corrosion fatigue cracks (approximately 100µm, 150µm and 700µm) including CRACK 2 positioned close to the same axial line. Fig.5 illustrates a schematic diagram of the inspection equipment using the distribution of Bz. The width of the MO sensor is approximately 0.8mm, which the unfavorable influence of the lift-off. The MO sensor is placed on the internal wall of the specimen which is magnetized in the axial direction(x-direction). The image is visualized using a polarizing microscope. To inspect CRACK 1 and CRACK 2 using this method, the MO sensor is rotated in the arc direction. Furthermore, the MO sensor is moved in axial direction and rotated in arc direction for scanning of the whole internal wall of the sample. The experimental data show that this method has a high sensitivity of micro cracks inspection. It is seen from Fig.6 that CRACK1 and CRACK 2 were visualized. It can be stated that the new crack inspecting method, which uses the vertical component of the leakage flux, Bz and a narrow MO sensor, is useful for measurement of the initiation and propagation of micro cracks on curved surface structures, eg. on the internal wall of a tube. Fig.7 illustrates a schematic diagram of an inspection system using the distribution of Bx. The MO sensor has a disk-shape and a part of it's boundary is positioned parallel to the curved surface of the sample. In this case, the unfavorable lift-off between the MO sensor and the sample is minimized. Crack visualization using the distribution of Bx is shown in Fig.8. It is seen that CRACK1 and CRACK2, which lay on almost the same circular arc, are visualized at the same time. Consequently, the movement of the scanning system, for crack inspection over the whole internal tube wall, is minimized when the method which uses the distribution of Bx is employed. A NDI probe, which could be useful for inspection of micro cracks in a tube by using Bz, is represented in Fig.9. A light beam which is generated by a light source and polarized by a polarizer passes through two achromatic lenses and a half mirror, and is reflected to a MO sensor which contains information about the cracks. An image of the cracks from the MO sensor is sent through the achromatic lenses and a relay lens to a CCD camera. A magnetizer for the above probe is illustrated in Fig.10 which visualizes the image. Two electromagnets are crossed, and magnetized alternatively. This allows visualization of every crack independent of its orientation. A NDI probe using B, is represented in Fig.11. A light beam which is generated by LED and polarized by a polarizer passes through a MO sensor which contains information about the cracks. An image of the cracks from the MO sensor is reflected to a parabolic lens and sent through a relay lens to a CCD camera. A magnetizer for the above probe is illustrated in Fig. 12. Two disk-shape ferromagnetic plates parallel to the internal wall of the tube are connected by four ferromagnetic rods. Electrical coils winded around the four rods generate magnetic field which has the same direction along the four rods and flows in the opposite direction along the tube walls. Magneto-optical methods are applied for inspection of the internal surface of a tube, and cracks with lengths 100µm and 250µm have been visualized employing this NDI methods using correspondingly Bz and Bx. The advantages of the NDI method which uses the horizontal component of the magnetic leakage flux density Bx are: (1) The lift-off from the curved surface is minimized and has an approximately constant value over the whole surface. (2) It scans a large area of curved surface at the same time. (3) The movement of the scanning system which includes the MO sensor can be minimized. An advantage of the NDI method using Bz and a narrow MO sensor is its large sensitivity. This method can be useful for inspection of smaller cracks than those inspected by the former method..